“Visiting Lake George without dining at the Log Jam…..is like going to Paris and not seeing the Eiffel Tower.” This authentic log cabin welcomes you with rustic simplicity while the servers provide the area’s most attentive service. The culinary staff offers the most expertly prepared fresh seafood, along with the best steak and prime rib anywhere. The live lobster tank and the very popular full salad bar are also available. 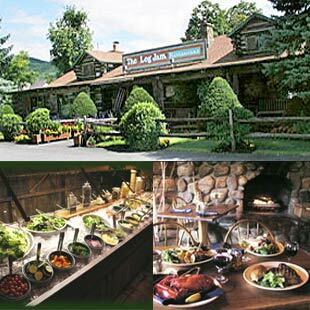 The Log Jam is a relaxing place to enjoy casual Adirondack dining. An old pot-belly stove, wood plank floors, and three massive stone fireplaces provides “an indoor experience… that rivals the outdoors.” Serving lunch and dinner daily year-round. Reservations are honored. Major credit cards accepted. The Log Jam Restaurant is located in the midst of the Factory Outlets on Route 9 in Lake George.